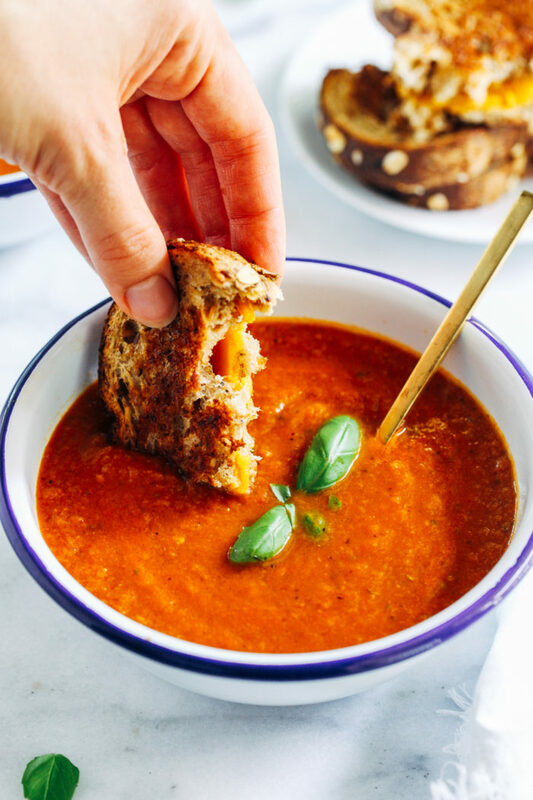 Easy Roasted Heirloom Tomato Soup- all you need is 8 ingredients for this simple tomato soup that is bursting with flavor. 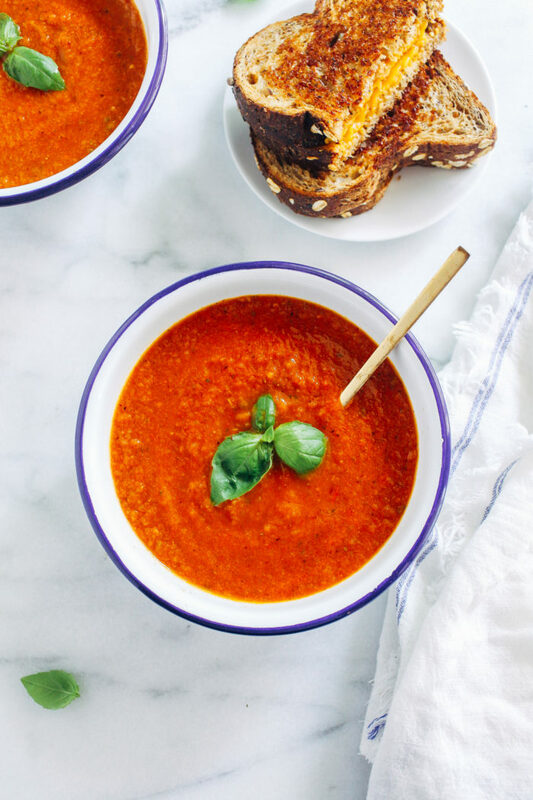 Once you try this you’ll never eat tomato canned soup again! 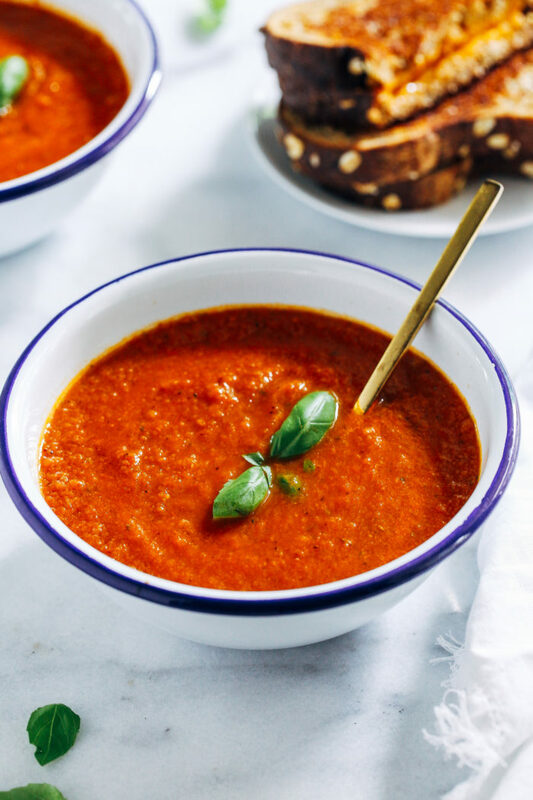 It feels ludicrous to post a soup recipe when it’s currently nearing 100 degrees outside, but we only have a few more weeks of tomato season so we have to get while the getting’s good! I have to admit though, finding a good melty vegan cheese isn’t easy. I personally can’t stand Daiya. The flavor, the ingredients…it’s just not my bag. I did find one recently called Parmela Creamy Nutcheese that’s pretty tasty. I mean they probably could have picked a better name than nutcheese but I guess it gets the point across. The first ingredient is cashew milk. It’s also aged so it has more of a real cheese flavor which I personally enjoy, and it melts well too. 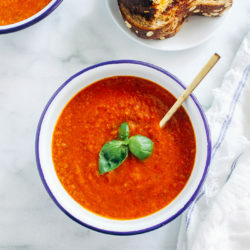 I titled this heirloom tomato soup because that’s my favorite variety but you can use any kind of tomatoes you prefer. There’s no hard rules here. 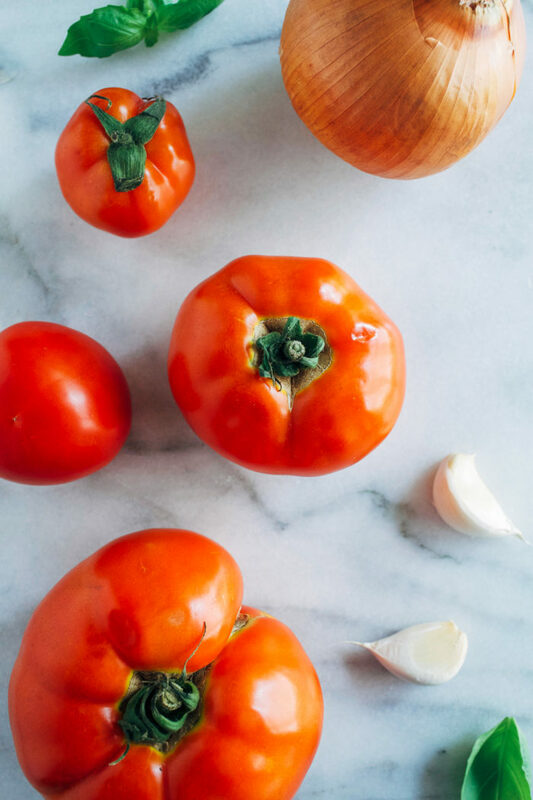 Making it is as simple as dicing the tomatoes, onion and garlic then roasting them until their flavors truly shine. From there you just transfer them to a blender with vegetable broth and herbs, and blend until smooth. It’s a little more effort than buying canned tomato soup but I promise it’s worth every second. Nothing can beat the flavors of freshly harvested tomatoes roasted with garlic. Especially with a melty grilled cheese. You can just wrap me in a cozy blanket and consider me right at home. Preheat the oven to 425°F . 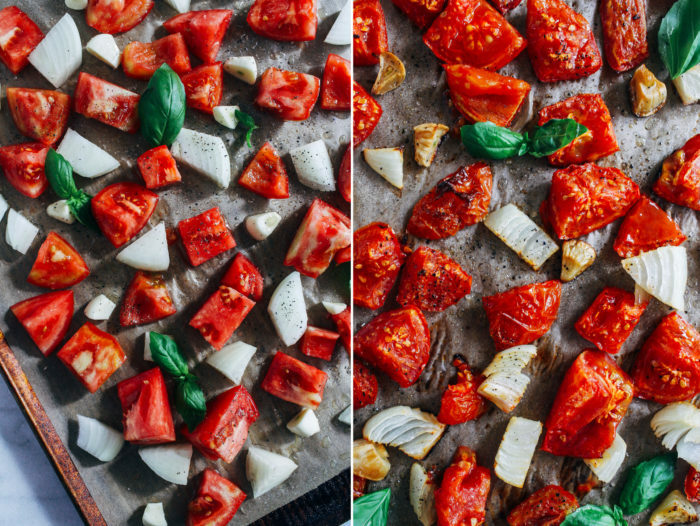 Arrange the diced tomatoes, onion and garlic on a baking sheet then toss (or spray) with high heat oil. Sprinkle with salt and pepper then roast in the oven for 35 minutes. Set aside to cool for at least 5 minutes. 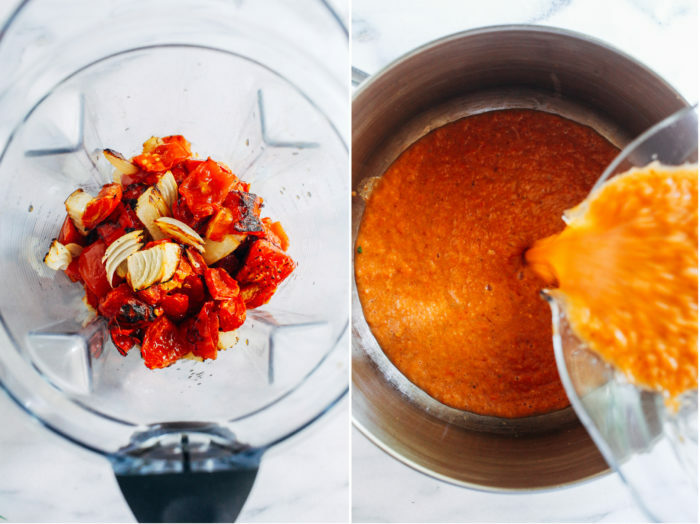 Transfer roasted vegetables into a blender with 1 cup of vegetable broth, oregano and basil leaves. Pulse until a thick and chunky texture is achieved (or smoother, if desired). Pour into a large pot and add more broth as needed. Alternatively, you could use an immersion blender and blend everything in the pot. Warm the pot over medium heat until the soup is heated through. Add more salt to taste, if desired. 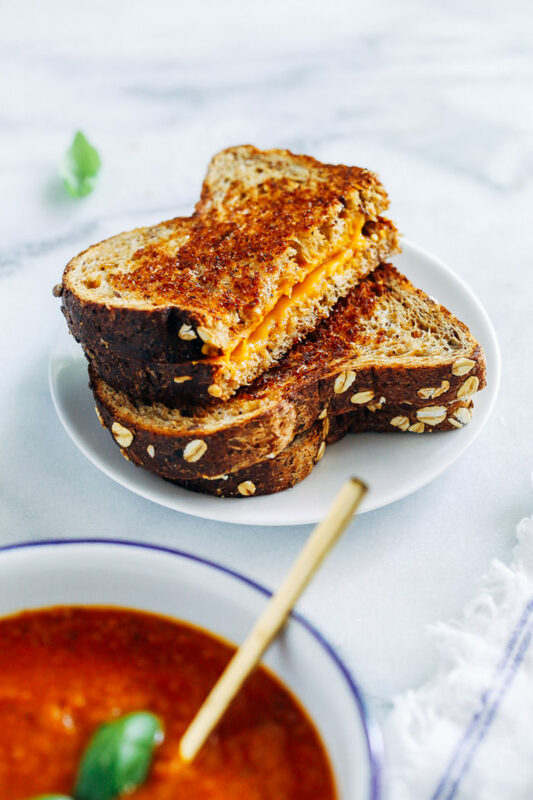 Serve warm garnished with chopped basil and a side of grilled cheese, and enjoy!